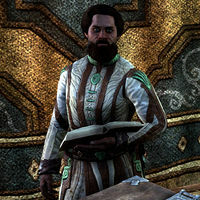 Abazadar is a Redguard enchanter who works out of The Gem & Flask in Belkarth. When you speak to him, he will say, "Come for enchantments? By Tava's red feathers, you'll not find better." This page was last modified on 7 January 2018, at 19:26.